With music-loving parents rock music had always been in the background growing up. By my early teens I’d begun taping a few things off my dad when I first got a portable tape recorder. But these are the first albums that I actually owned. My dad had been an early adopter as far as AC/DC were concerned, buying High Voltage not long after it was released in the UK and playing it pretty much constantly as I recall. Highway to Hell came out in 1979 and not only did my dad have a copy but my older stepsister had one, too. By 1981, though, she was getting far more into punk and so gifted me her copy. My first rock album – and what an absolute classic to start off with. Not the greatest Quo album but a good solid album and a great cover of ‘Somethin’ Bout You Baby I Like’ which had made the top ten. I was already a confirmed Quo fan when the album was released in March 1981, just in time for my fifteenth birthday in May – thanks Mum! Another fifteenth birthday present (thanks Dad!). I’d been aware of Slade in the early 70s, of course, but by the time I was a teenager they’d virtually disappeared off the radar completely. But I remember watching Top Of The Tops when Slade burst on the screen with their brilliantly raucous comeback single ‘We’ll Bring The House Down’. I asked for the album for my birthday and a life-long devotion to all things Slade followed. Not Slade’s most famous album by a long stretch, but in terms of making an impact on a youthful Darren perhaps the most significant album I ever owned. A friend at school sold me this second-hand. He decided he was a punk not a metalhead and this was therefore surplus to requirements so I bought it off him for 50p. A true classic album, I loved (and still do) the combination of Jon Lord’s eerily atmospheric Hammond, Ritchie Blackmore’s manic guitar wizardry and Ian Gillan’s deranged screaming. Deep Purple had been defunct for several years by this time but this was an indication that I would be dipping back into the back catalogues of the previous decade for many of my subsequent musical purchases over the coming years. Bought from a record shop in Southport while I was in a youth theatre project this album immediately impressed – with one unforgettable tune after another. Just a few weeks later Whitesnake, along with AC/DC and Slade, would be one of the first bands I ever saw – live at the Donington Monsters of Rock festival. I remember getting this from the local newsagents where they had a small rack of cut-price LPs amongst all the magazines and sweets. I bought it mainly for the title track and ‘Living On An Island’ but this became an album I played loads. Another bargain, this is one I got cheap from a mail-order company. I had already taped my dad’s copies of ‘Rising’ and ‘Ritchie Blackmore’s Rainbow’ by this time and was a fan of Ronnie James Dio’s vocals but I also really warmed to the more commercial rock of the Graham Bonnet-fronted Rainbow, too. Still a really great album and still one of my favourites. I took this (along with my recently-purchased Ready an Willing and Whatever You Want) to a party in the summer of 81 and they all got a bit scratched and battered, sadly. It was an early lesson in why you should not take records to parties – but, with any luck, hopefully someone would be inventing the CD for me in a couple of year’s time…. So that was my first bunch of albums. Many, many hundreds more would follow over the years. But, looking back, I feel fairly nostalgic thinking about how it all started for me and, if I may so myself, not a bad choice of albums at all…. 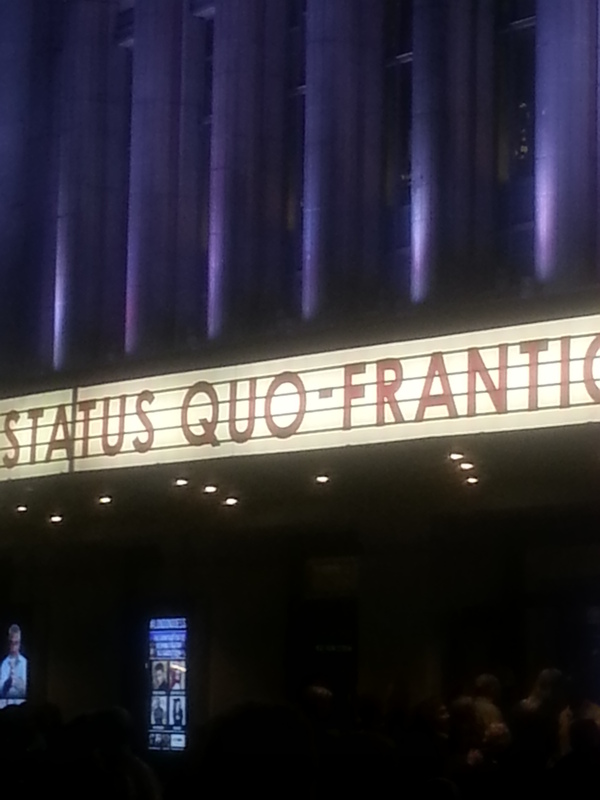 Status Quo are a band that stopped worrying about critical acclaim and musical credibility long, long ago. After the band’s 70s/early 80s peak we’ve seen cringe-worthy covers albums, sing-along football songs, bizarre collaborations with the Beach Boys; in fact you name it, they’ve tried it. Even the well-received reunion of their classic 70s line-up in 2013 was immediately followed by a completely unfunny mafia comedy film set on a tropical island. So the idea of a Status Quo acoustic album and tour could be dismissed as yet the latest undignified attempt in a long line of pointless gimmicks. Except that… the album was actually rather good. 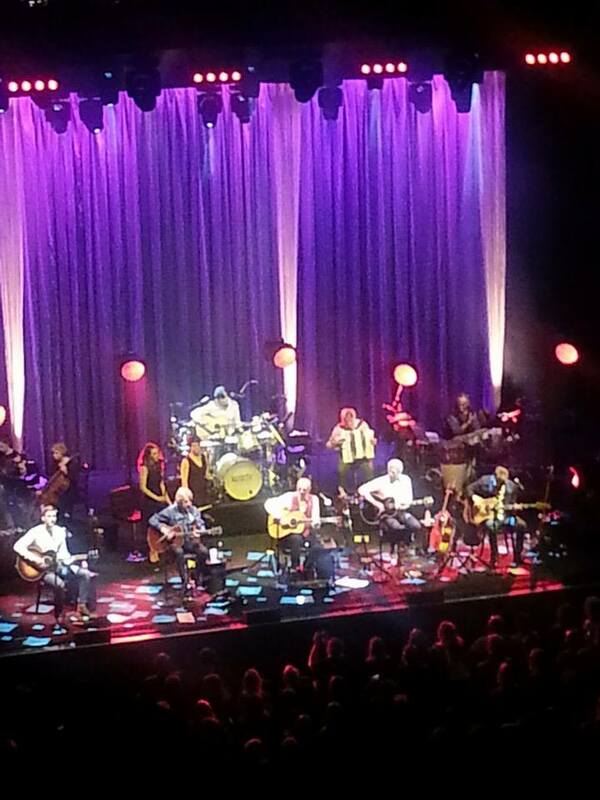 And following a strong reception to a one-off acoustic show at the Roundhouse last year, touring it was an inspired idea. More than simply strumming along to some old hits, however, the band took the trouble to create completely reworked arrangements for the album and they are replicated here tonight. The acoustic guitars and harmonica are complimented by a range of other instruments, including mandolin, accordion, viola, cello and violins. Joining the modern era line-up of Status Quo (Francis Rossi, Rick Parfitt, Andrew Brown, John Edwards and new-boy Leon Cave) are an additional nine musicians as well as two female backing singers, all of whom, Rossi tells the crowd, played on the album. Rather than the usual Quo gig, the elegant lighting, back drapes and stage full of seated musicians looks more like the setting for a 1950s dance band. The sound is still unmistakably Status Quo but the light and breezy arrangements and sensitive vocals show off the quality of the songwriting and bring out new depths to often familiar songs. A beautifully laid-back version of early 80s hit “Rock ‘n’ Roll” is a particular highlight and there are some lovely reworkings of earlier material like “Reason for Living”, now re-imagined as a folk-rock rock classic. Rain is given a makeover as a countrified acoustic blues and a classically-infused Mystery Song, with exquisitely catchy string accompaniment, is another highlight. Of course many of the best known classics are included, too, like Caroline, What Your Proposin’ and Down Down. The set proper is finished with Whatever You Want and Rockin All Over the World, the acoustic treatments creating the perfect setting for a mighty communal sing-along. Thankfully the post 1983 material has been kept to a minimum in favour of earlier classics, but they encore with a nicely sensitive version of Rock ‘til You Drop. That is then followed by the gimmicky jig, Burning Bridges. It wouldn’t be my choice for a Quo encore but the crowd lap it up and you can forgive the band one lapse of good taste after such a stunning evening. Normally, I’m all for big named bands giving up-and -coming ones a helping hand with a support slot on tour. But when it comes to big rock reunions, and I’ve seen a few, nothing beats a well-chosen, established act from a similar era to kick things off. Status Quo have chosen brilliantly here by getting in Wilko Johnson as the support for their “frantic four” classic-era reunion tour. Diagnosed with terminal cancer in early 2013, former Dr Feelgood guitarist, Johnson, made the brave, inspirational and utterly life-affirming decision to use his remaining time, not pursuing a debilitating and ultimately futile course of treatment, but by saying farewell to his fans with a series of live dates. There has been no sign of his being incapacitated just yet and so further dates have been added, the Quo tour being the latest. And what a magnificent performance, not only from Wilko but from bass player Norman Watt-Roy and drummer, Dylan Howe. The crowd roared its approval as the trio delivered blistering performances of Feelgood classics like Roxette, Back in the Night and She Does it right. The admiration and affection for the man tonight was moving but this was no mere sympathy vote. It was a genuinely magnificent set and the crowd responded accordingly. Quo could not have chosen a better way to open up the evening. After a shortish break the lights dimmed, the famous spoken intro from the 1977 live album was relayed over the PA, the silhouette backdrop made famous by the “Hello” album cover came down and Francis Rossi, Rick Parfitt, Alan Lancaster and John Coghlan walked on stage. The four are reunited for a second time after their reunion tour last year following a 32-year break. Since the demise of the classic line-up in the 80s Status Quo, under Rossi and Parfitt, has very much continued, of course. But what we saw tonight was something very different from the lighter keyboard-heavy pop-rock act that continues to fill arenas every year. Like last year’s Quo re-union tour, again there was a focus on material from the early 70s albums, rather than the big hits of later years. It was a very similar, setlist too, but although lacking the emotional resonance of seeing four guys walking out on stage together for the first time in over 30 years, it more than made up for that by being a somewhat tighter performance from the band than in 2013. As in last year’s reunion, returning bass player, Alan Lancaster, got a hefty slice of the lead vocal duties, Lancaster’s gritty vocals being something that later versions of the band have definitely missed out on. I’ve seen the post-Lancaster/Coghlan Status Quo at a couple of festivals, and while they are undeniably fun and entertaining, the quality of songs and the earthiness of the performance when the original four get on stage together provides something different altogether. Highlights for me were Lancaster opening with Junior’s Wailing, Rossi singing In My Chair, and a magnificent performance of perennial crowd-pleaser Forty Five Hundred Times. Although the focus was very much on album classics, I must confess when I saw them last year I was ever so slightly disappointed that they had chosen not to play one of their greatest ever hit singles, Caroline. Tonight, though that was rectified and the band encored with a magnificent version of Caroline, followed by traditional show closer, Chuck Berry’s Bye Bye Johnny. Definitely, a memorable night for British rock.